Dame Sarah Storey won a 13th Paralympic gold to lead the British medal charge at the time trials in Rio de Janeiro. 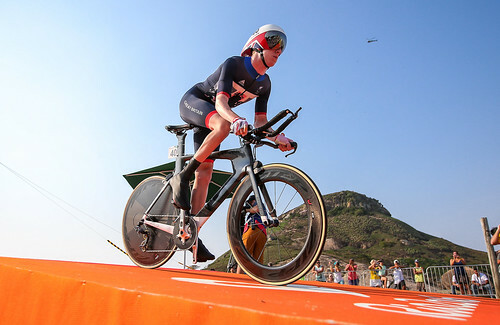 Storey cemented her status as Britain’s most successful female Paralympian with victory in the C5 time trial as ParalympicsGB's cyclists won three gold and two bronze medals. Karen Darke added a second gold medal in the H1-2-3 time trial, the hand-cyclist's first Paralympic gold. Tandem duo Steve Bate and pilot Adam Duggleby then won their second gold of the Games with victory in the B time trial. Lora Turnham and pilot Corrine Hall took bronze in the women's tandem time trial before David Stone rounded off the medal haul with bronze in the trike T1-2 time trial. Storey - who won individual pursuit gold on the track to pass Tanni Grey-Thompson’s tally of 11 golds - was on a level of her own as she completed the two laps totalling 20km in 27:22.42. Storey, 38, was over a minute-and-a-half quicker than Poland’s Anna Harkowska who took silver with American Samantha Bosco winning bronze. "It is really exciting," Storey said after the race. “It was actually quite nice conditions. A really strong tailwind on the way out and therefore a really strong headwind on the way back and that was crucial to recognise. Crystal Lane just missed out on joining Storey on the podium. The individual pursuit silver-medallist was fourth in 29:37.23. Karen Darke ended her wait for Paralympic gold in the hand-cycling H1-2-3 time trial with a time of 33:44.93. Darke, a silver and bronze medallist at London, was 17 seconds quicker than American Alicia Dana after one lap of two. And although the American reduced the deficit on lap two, Darke was 12 seconds quicker at the finish to take her place at the top of the podium. “I honestly can’t believe it,” Darke said. Ste Bate and pilot Adam Duggleby won a second gold in as many events in the tandem time trial. The duo had won the tandem pursuit on the track and carried their form to the road in a nail-biting finale to the 30km event. The pair led at the 15km mark by just 11.59 seconds over Dutch riders Vincent Ter Schure and Timo Fransen and although the Netherlands riders produced a better second lap, Bate and Duggleby crossed the line in 34:35.33, eight seconds faster than their rivals. “Pretty sublime," said Bate on the win. “It’s a team effort,” Duggleby said. “We both train just as hard as each other, we train together a lot and have been doing loads of time trials at home. This was our main focus." Lora Turnham and pilot Corrine Hall had also won individual pursuit gold on the track and added bronze in the tandem time trial over 30km. They stopped the clock in 39:33.81, 34 seconds slower than winners Katie George Dunlevy and pilot Evelyn McCrystal of Ireland. David Stone won bronze in the trike T1-2 time trial over 15km to collect his fifth Paralympics medal. The double Paralympic champion in Beijing completed the course in 24:42.25 - one minute and 44 seconds slower than winner Hans-Peter Durst of Germany. In the men’s C2 time trial, team sprint gold medallist Louis Rolfe finished seventh. The 19-year-old delivered a strong ride in 29:12.16 as Canadian Tristen Chernove won gold in 27:43.16. Megan Giglia was also out to add a road medal to her track gold. Her time of 31:44.56 saw her take sixth in the C1-2-3 time trial as the Paralympic title went to Alyda Norbruis of the Netherlands. Hannah Dines was fifth in the trike T1-2 women’s time trial as she made her Olympic debut. Dines set a time of 28:51.20 as Australia’s Carol Cooke won in 26:11.40.